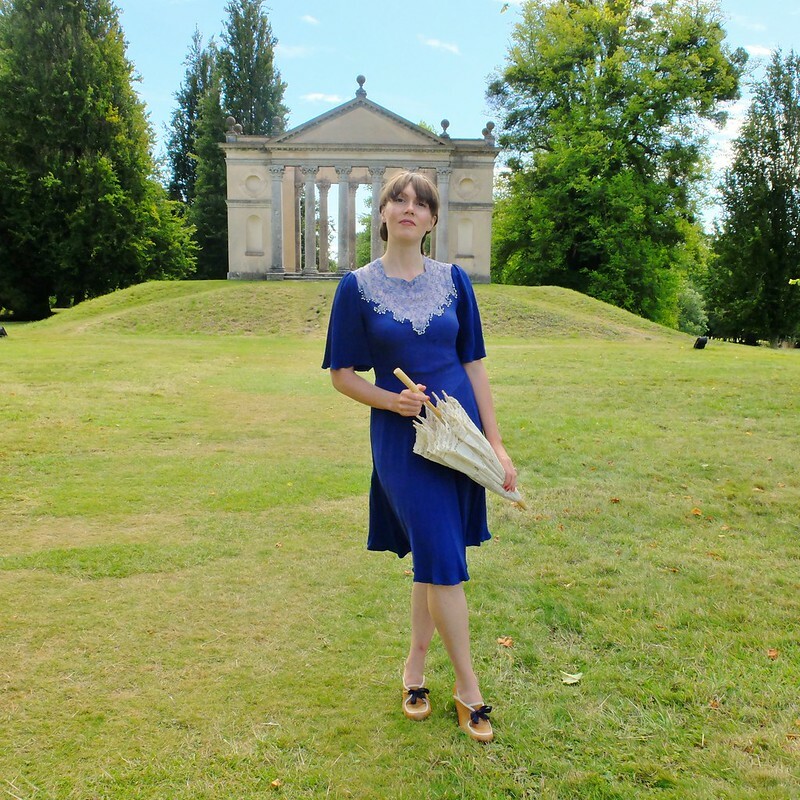 I went to Downton Abbey as part of my hen weekend!! 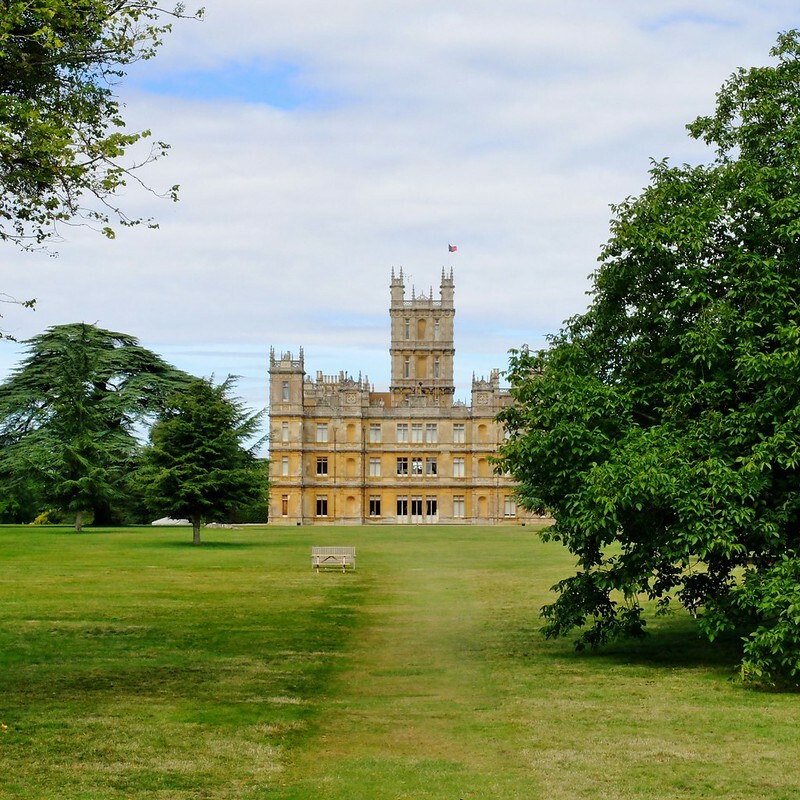 I say 'Downton', what I mean is Highclere Castle near Newbury in Berkshire, which was the home of Lord Canarvon, famous for discovering Tutankhamun's tomb. 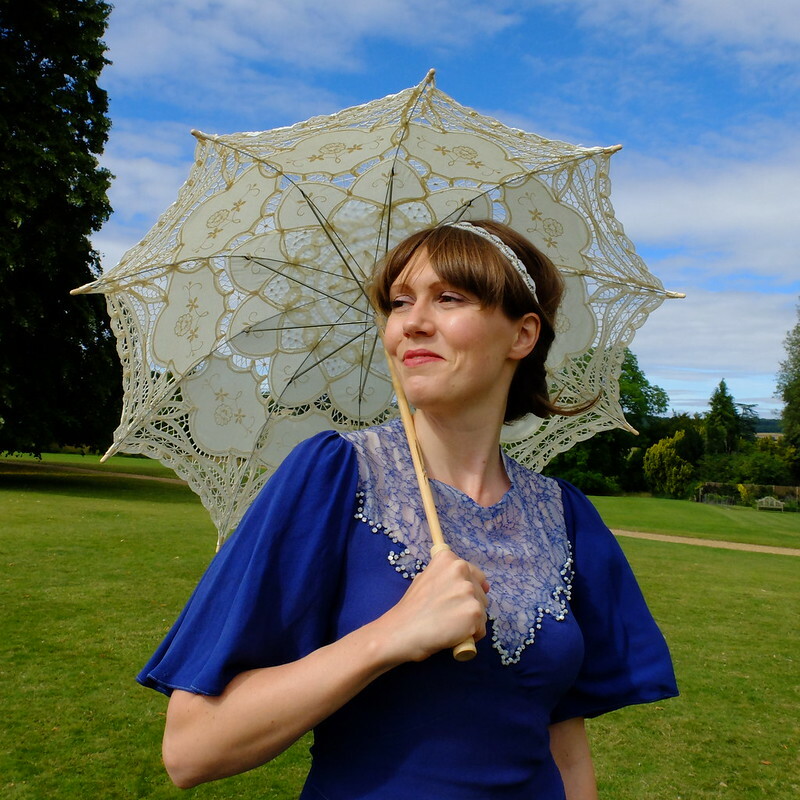 The series Downton Abbey films at the house and grounds, making use of three of the bedrooms, and a selection of downstairs rooms, including the dining room and that fabulous hall that looks like it belongs in some Scottish hunting lodge. Isn't the building impressive? Photos all by my Mother! Thank you! 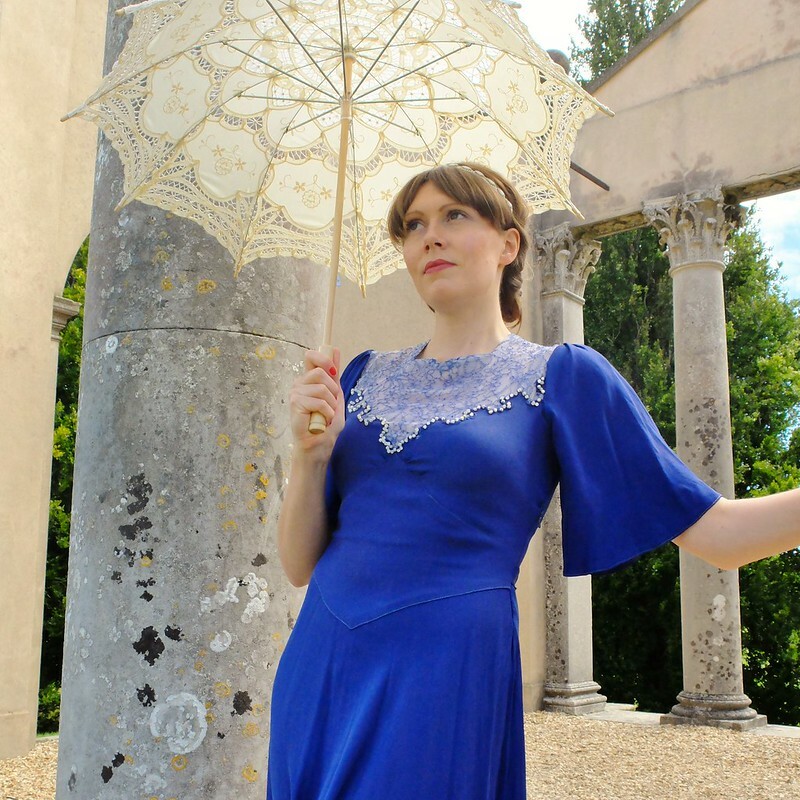 The series is set in 1912 and follows the characters through to the mid 1920s. 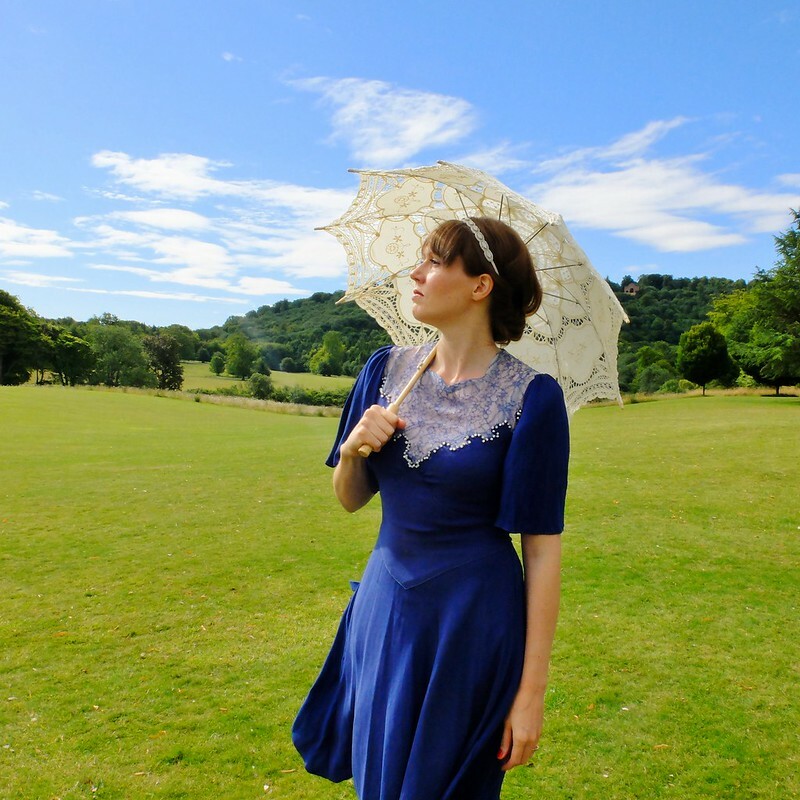 I don't own any true vintage from that time period, the oldest piece I have in my wardrobe being this re-worked 1930s dress. 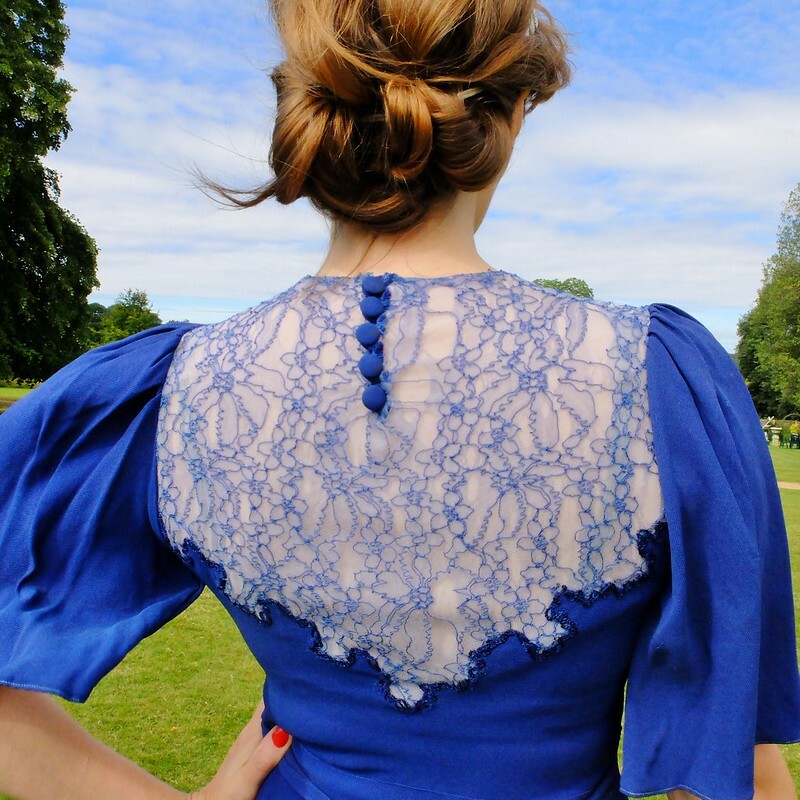 Originally it had long disintegrated lace sleeves and was floor length, but it was in awful condition and I made new sleeves from the hem. It's very, very fragile still - this is probably the last time I shall wear it. I would like to make a pattern from it and then perhaps frame it as a work of beauty! 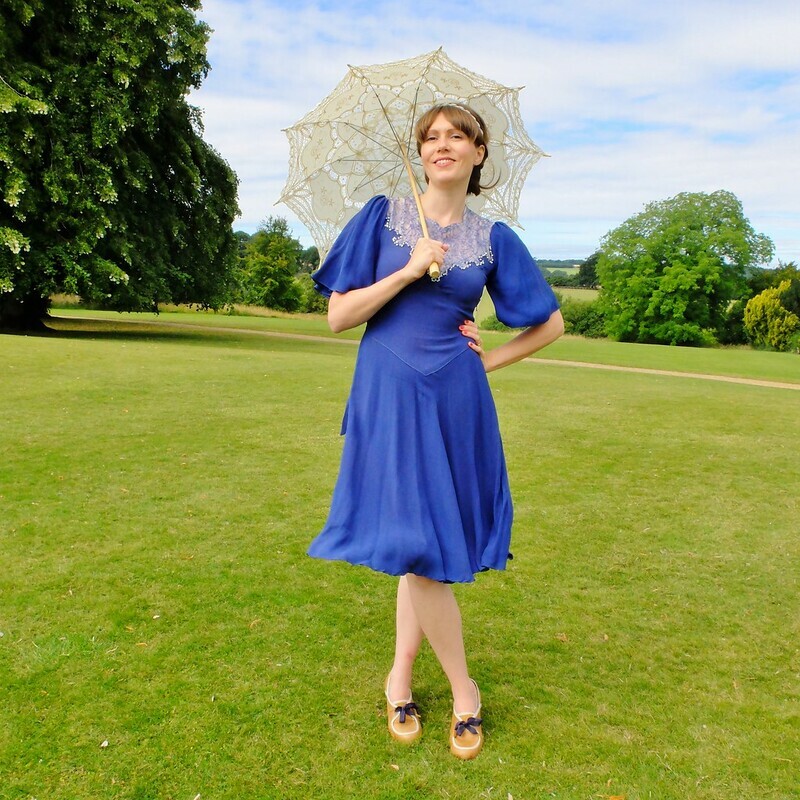 What better setting to give this dress a final outing than the sweeping grounds of Downton Abbey? The slightly bemused expressions on most photos are due to my lovely Mother being the photographer for the day. She got quite into it and was bossing me about in no time, much to the amusement of my sister Louise who was standing watch. The three of us formed a splinter group from the hen party on the Sunday and we had arrived very early indeed to ensure that we could purchase 'walk-up' tickets, as the pre-booked ones sell out about 6 months in advance. It was lucky we decided to tackle the photos first, as within an hour the grounds were swarming with tourists. It's a very, very popular attraction thanks in no small part to Downton Abbey I'm sure, and it became very crowded indeed in the upstairs section of the house. No time for loitering, and you are not allowed to take photos indoors anyway. As well as the grounds and house, you can visit an Egyptian exhibition in the basement that details Lord Carnarvon's expedition history and houses a number of fascinating original Ancient Egyptian artefacts (including 4,000 year old eye-liner!). In the final room there are some mock-ups of the most important finds, as the originals are in the British Museum in Cairo (I actually have been there and seen the original Tutankhamun mask, and they've done an excellent job on the reproductions). 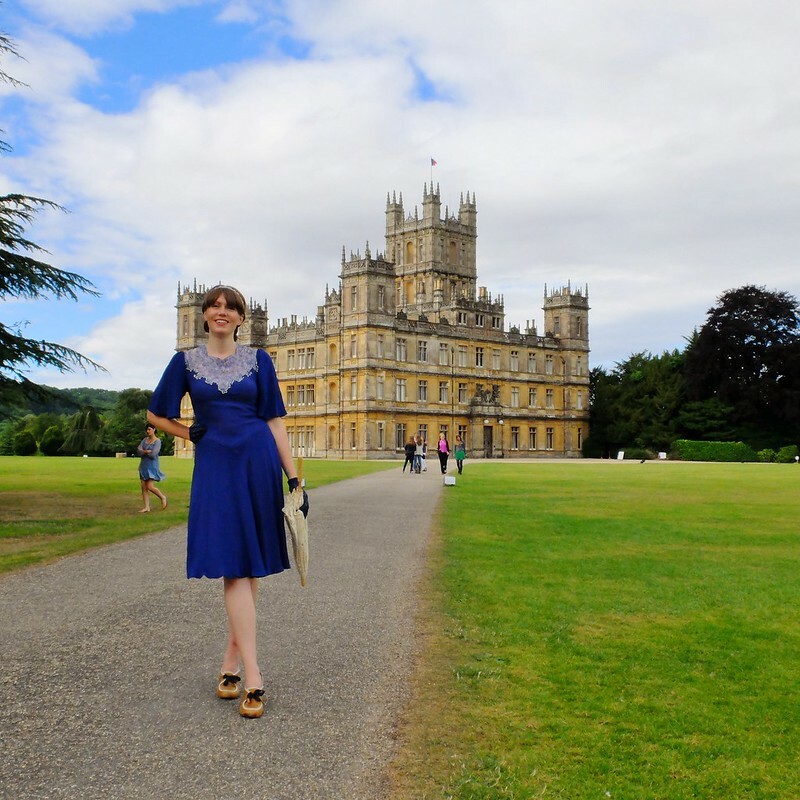 We all had a very enjoyable visit, and we're keen to watch Downton Abbey again so that we can shout 'I've been there!' at various moments throughout the programme. 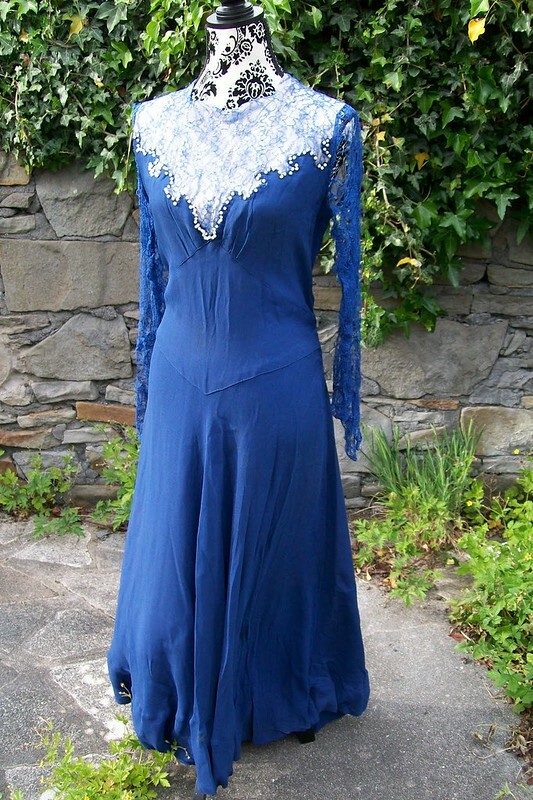 I'll leave you with a 'before' picture of the dress. 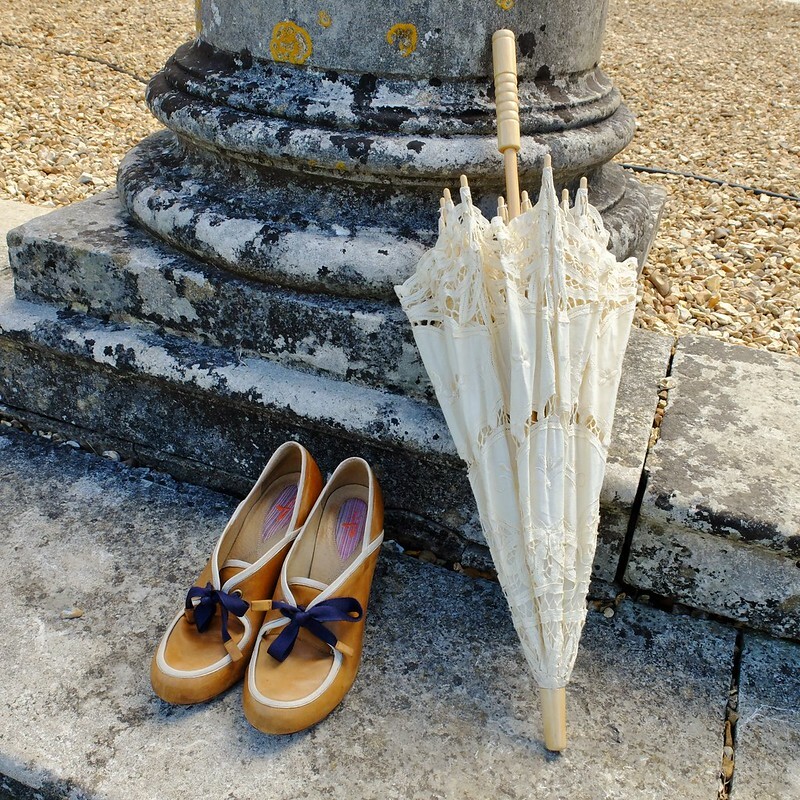 I'm signing off for a while now - this is my last post as an unmarried woman! I hope you all have a wonderful couple of weeks, and I look forward to catching up with you all when I'm back from the wedding and honeymoon. What a fun trip and a stunning dress! All the best! Enjoy your marriage. I didn't know you could sew! You did a cracking job with refashioning that gorgeous frock. Never watched DA so I don't know the location but it looks lovely. Really clever how you adapted that dress, especially the sleeves. The colour is stunning and you look fab, especially against that backdrop! Also, would never have guessed those were J shoes! 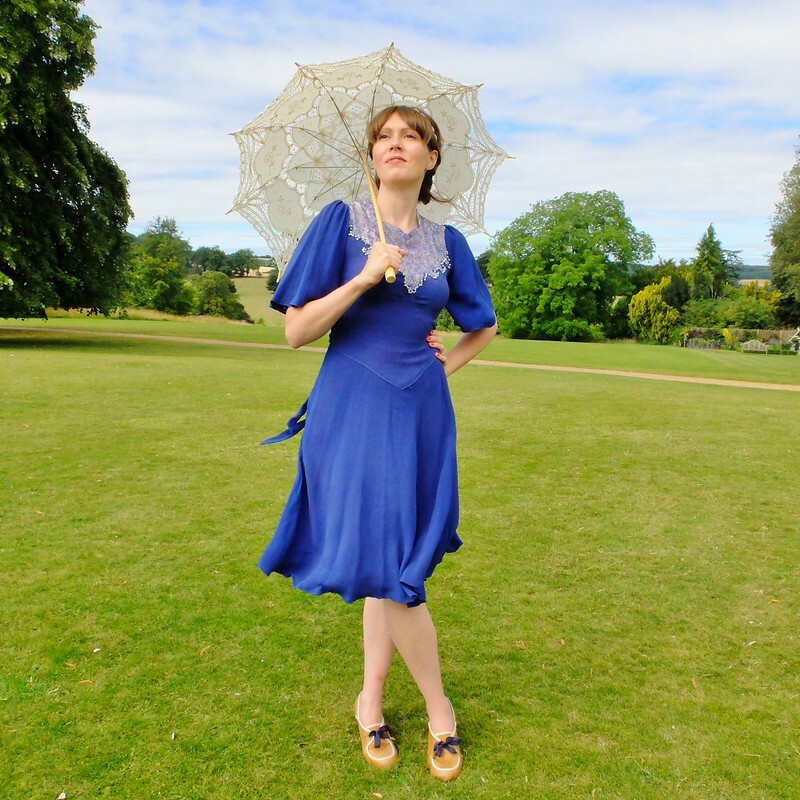 What a lovely place to give your dress its last hurrah. I hope your wedding all goes well, and you have a wonderful time :-) Being married is super. This dress is so pretty, I really like the sleeves you added! 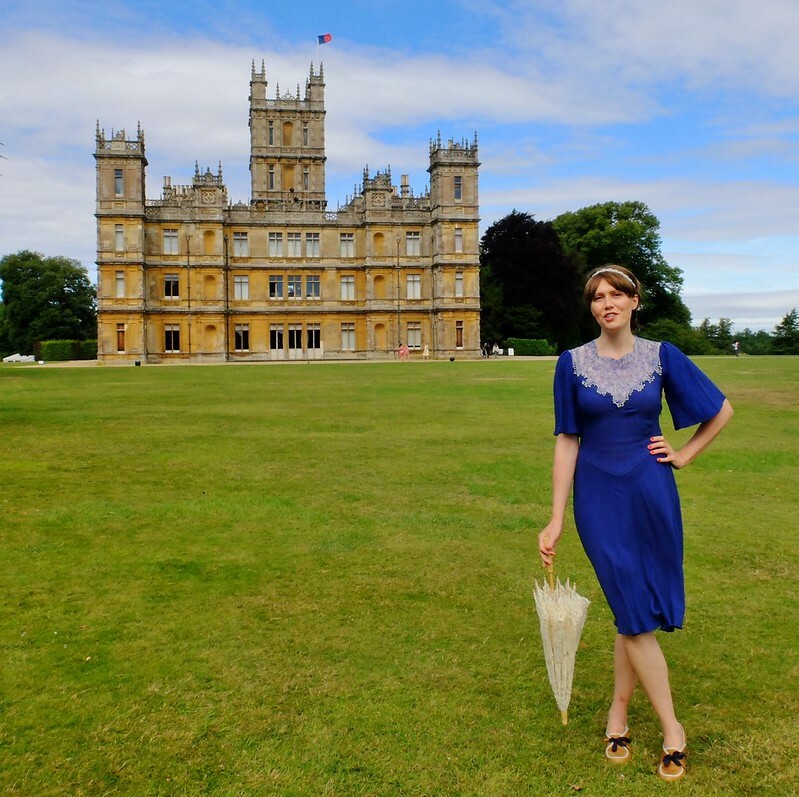 I am also jealous as I would love to visit Highclere! 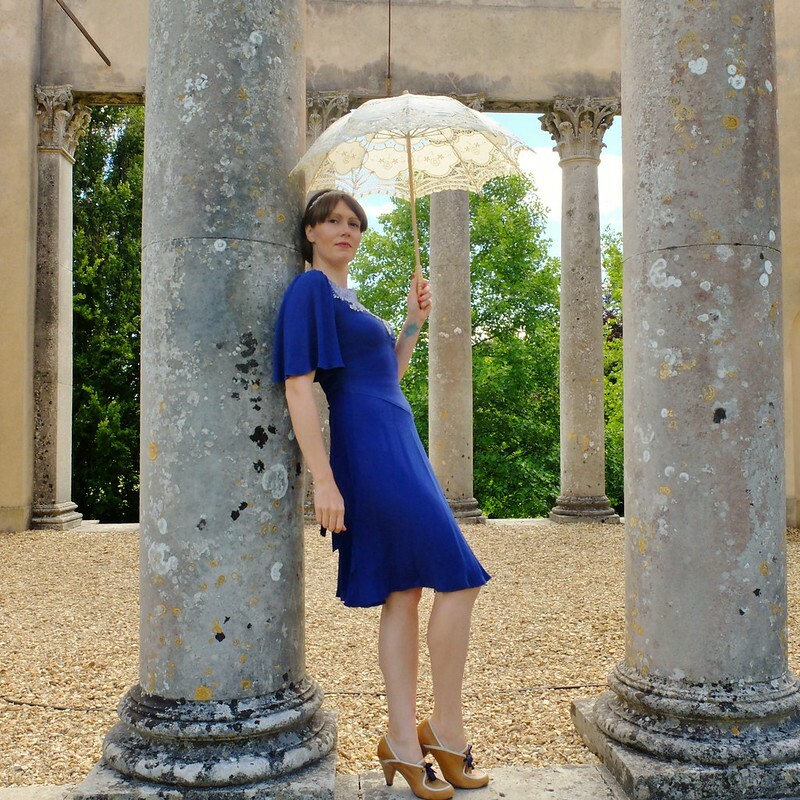 Having outfit photos from the grounds of Downton is pretty awesome in itself, but getting to tour the place sounds so fun! Its good that you got there early and had a little time before the onslaught of tourists arrived. Have a wonderful wedding and congratulations! How marvelously cool! Your dress is a true vision. The colour, the classic style, the silhouette, it's all as breathtaking as the castle itself! Well done on that fantastic recession. You have done an amazing job, and the lace is super pretty! I am a little envious of this fab location !!! !